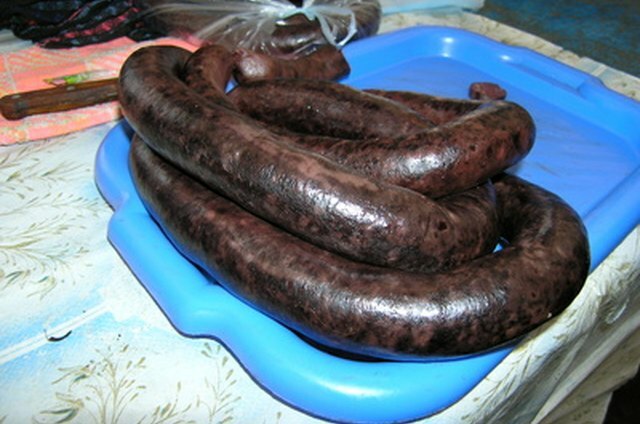 Blood sausage is an unusual butcher's delicacy made by cooking blood or dried blood with a filler, such as pork or other meats, which gives the sausage a dark color. 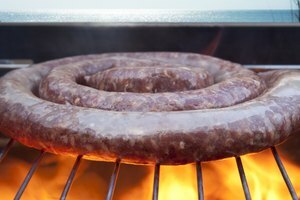 Though blood sausages share texture and properties with regular meat sausages, there are a few special considerations you should take when preparing them. Make sure the sausage is uncooked, as most blood sausage is sold pre-cooked. If already cooked, the sausage will be as firm as a cooked bratwurst and have a grey purple or purplish black color. If raw, it will be reddish brown or brownish red and quite soft and squishy. Poke about 10 small holes with a toothpick in the casing of each sausage; these will allow the steam to vent while cooking and prevent the sausage from bursting. Space the holes all over the sausage, middle and ends and top and bottom, so that the sausage vents properly when cooking. Cook in a microwave by heating for short intervals at a time. Go 30 seconds at a time until the sausages have uniformly turned greyish purple. Test one of the sausages by cutting into the middle to make sure it's done; if any portion of the center is still pink or brownish, continue cooking until the sausage is purple throughout. 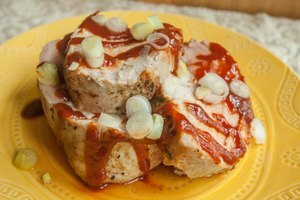 Bake in the oven with a liquid stock (meat or vegetable broth). Preheat and cook at 350 degrees F for 40 to 60 minutes. 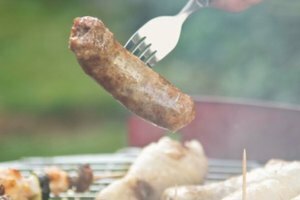 Every 5 to 10 minutes, turn the sausages a quarter turn using the tongs, so that they cook evenly. The sausages are done when they are purple throughout and the outer surface has browned. Grill the sausages on an indoor or outdoor grill. Turn the sausages often to prevent overcooking parts of the outside before the inside has cooked. 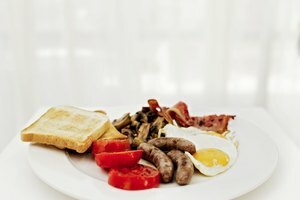 Cook sausages on the stovetop in a deep frying pan filled with a mixture of half water, half soup stock. 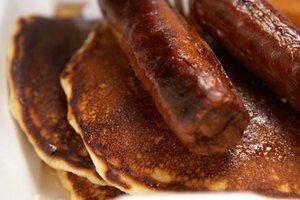 If the pan isn't deep enough to fully submerge the sausages, turn them frequently to make sure they evenly cook. 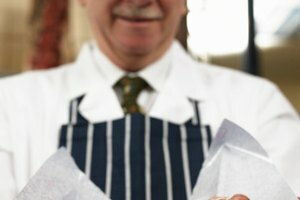 What Does It Mean When Beef Sausage Turns Gray in Color After Cooking?